1. Tri-Fold design is easy for carry and could avoid mirror scratching. It can be open and fold like a book when not using. 2. This Tri-fold mirror can provide a wide angle and viewing for you to makeup clearly. 3. 7X Magnification Mirror is very convenience and more clearly for eye makeup. 4. It with a big storage case, which could loading kinds of size makeup tools such as lipstick, eyelash curler and powder puff etc. 5. It could stand on storage case stably by a seam line. 6. This Fascinate Mirror with dual power supply: USB Chargeable & 4pcs AAA battery powered ( not included ) This mirror can not be store power. For any reasons if you are not satisfied with your purchase, we offer a 100% 30-day money back guarantee ! Meanwhile we offer a one year quality warranty. ◆ Put up the Trifold Mirror and rotate 180 degrees. ◆ Put the side where close to your body on storage box to hold stably. ◆ Open the Trifold mirror for a good viewing and take out the 7Xmagnifying mirror from back, then put on the middle mirror. ◆ Touch switch, then light turn on/off. Keep on pressing switch 3seconds, then can adjust brightness. ◆ This Mirror could to use by USB connector with 5V/1A adaptor or power supply directly. External Power Supply plug in which won't be effect the battery working life. 1. 1X & 7X MAGNIFICATION MIRROR: Tri-fold Mirror is plane mirror with a 7X magnifying mirror put in back. It can supply a wide-angle viewing for you to see face clearly, and make a more perfect makeup with each detail, especially perfect for tweezing and eye makeup. 2. 24 PCS LED LIGHT: Our Vanity Mirror is built in 24 pcs LED lights, allow you makeup in the dark or poorly light areas. Led lights brightness control by the touch sensor switch. Keep on pressing the touch sensor 3 seconds to adjust the brightness. 3.180 DEGREE FREE ROTATION: The lighted makeup mirror stands on your countertop can be freely adjusted and fixed a perfect and comfortable viewing angle. Tri-fold and detachable design makes you can take it anywhere you go. 4. DOUBLE POWER SUPPLY: This Led mirror can either operated by 4 pcs AAA batteries (not included) or USB cable to make it work, mirror could not be store power by itself. 5. 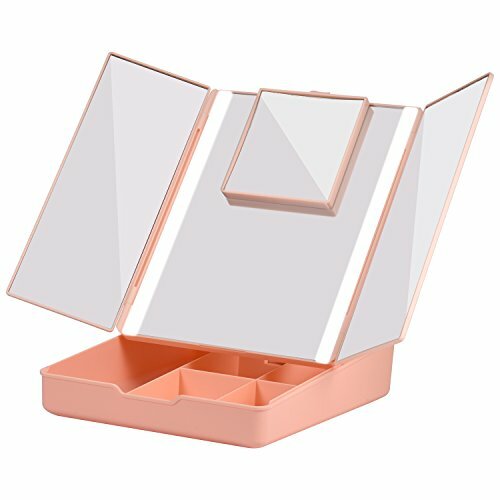 STORAGE BOX: This Mirror with a big storage box and could to be loading different makeup tools. If you have any questions about this product by Fascinate, contact us by completing and submitting the form below. If you are looking for a specif part number, please include it with your message.